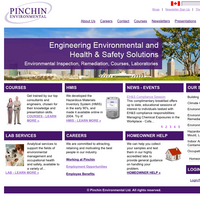 Pinchin Environmental is a Canadian company specializing in environmental consulting. Launched in October of 2008, this project involved replacing the previous DreamWeaver-based site with a modern, standards compliant website. Using Drupal 5, the site offers features and functionality impossible to implement with the previous system. This module allows users to have a "Send file" page where users can send a file directly to their Dropbox account. It will also contain additional API functions as Dropbox makes them available. Many Drupal themes implement "zebra-striping", where table rows alternate background colours. This helps to improve the readability of tables by providing a visual queue to easily see which items are in the same row, even across a large table. Unfortunately, if tables are used within content, then it is unlikely that users will manually add the appropriate even / odd CSS classes to table rows. This module transparently adds those classes, without any intervention on the part of the user. 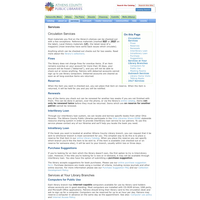 This module allows for users to book resources for use during events. For example, a student can book a microscope for use within their lab. If there is a pre-existing event which conflicts in both time and resource, a form error is displayed and the user is forced to either book a different resource or change the event times. Sometimes it is useful to have content types which are excluded from Drupal's search mechanism. For example, you might use the Image module to store "clipart" style graphics, or additional content types are being used to store information always displayed in conjunction with other types with Views Fusion. This module lets individual nodes or entire content types be excluded from the search engine, helping to ensure that users find relevant content quickly. 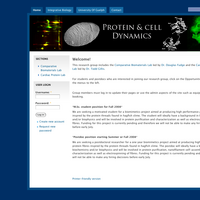 This project is maintained by Andrew Berry, but has many contributors. Feature development has been sponsored in the past both by the University of Guelph CSA and Pinchin Environmental. 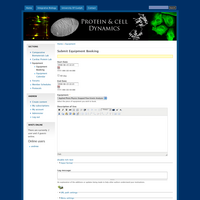 This web site was built for a biology laboratory group at the University of Guelph. Primary goals included the ability to update the site content easily, as well as the centralization of laboratory documentation. The implementation of an internal Protocols section allowed users to easily find protocols, as well as enabled sharing of common protocols between professors. Equipment booking functionality was written as a new feature, and is available as the Resource Conflict module for Drupal under the GPL. 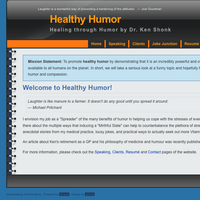 "Healthy Humor" is the name of Dr. Ken Shonk's public speaking business. Establishing a simple website presence allows him to easily showcase his unique topics and extensive medical background. Healthy Humor is a portal allowing prospective clients the ability to find more about him and his services, as well as easily contact him for further information. 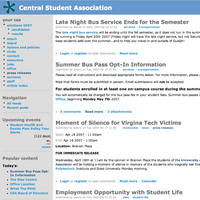 CSA Online was managed under contract for a period of 1 year. The previous incarnation of the website was based on static HTML and server-side includes; this allowed the website coordinator (and the website coordinator only) to easily update the content on the website. Some changes, such as modifying the footer, or the structural layout of the site, would require significant changes, and likewise would incur a significant risk. It was determined that in order to efficiently manage the site and the constant updates to content that a Content Management System would be appropriate.